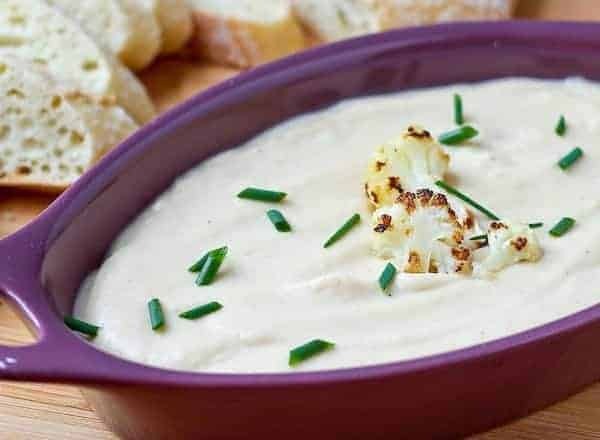 This roasted cauliflower and cheddar dip is unbelievably creamy and flavorful – blending the cauliflower into a silky dip helps greatly reduce the calories in this dip. It’s really quite annoying and I wish I could make it stop. As soon as I hear or see the word “dip,” the song starts playing in my head. But here’s the thing – I’m so lame (yes, SO LAME), that I had to do a Google search to find out who the artist was. And I’m afraid if I type the name of the group in this post, Google will flag me for questionable content and ban me forever from search engines. Which is basically a blogger’s worst nightmare. I’d turn in my whisk and mixer and call it quits if that happened. I can’t even bring myself to link to the song/lyrics/YouTube video. This is a family-friendly site after all! I can’t do it. And do yourself a favor and don’t google it or read the lyrics. Now I’m even more annoyed that I get that song stuck in my head when I type the letters D-I-P. I think it’s time to move on. Definitely time to move on. This dip. Which is actually very wholesome. Unlike that song (yeesh!). This wholesome dip starts lots of cauliflower – an entire head of it. 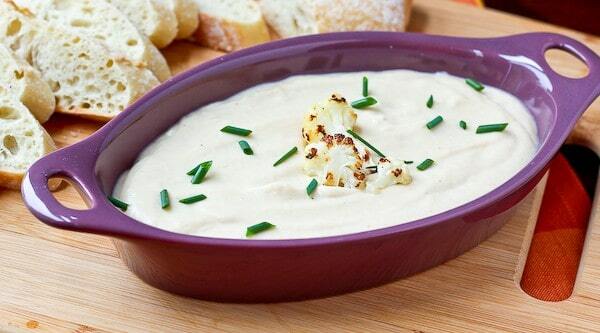 I roasted the cauliflower to give the dip an extra dimension of flavor. If you’re scratching your head about the roasting – here’s how to roast cauliflower. Your life will never be the same. While the cauliflower roasts, you can concoct a quick white sauce – a little butter, flour and milk is all it takes. Once the cauliflower was nice and brown and crispy, I pureed all of it except the few pieces I left out for garnish. 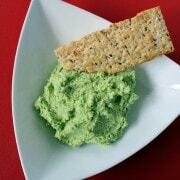 A few garnishes on this dip are a good idea since the color is a bit boring. You’ll add a bit of your sauce to the cauliflower to help the blender along. All that’s left to do after it’s smooth is stir it into the remaining sauce and then add cheddar. 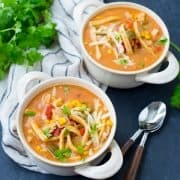 I used the sharpest white cheddar I could find to give a punch of great flavor without having to add too many calories. If you taste it and feel like it needs more cheese, feel free to add it! More cheese is always a good decision, especially extra sharp white cheddar. Plus, it’s Dairy Month, so it’s only right to add more cheese. 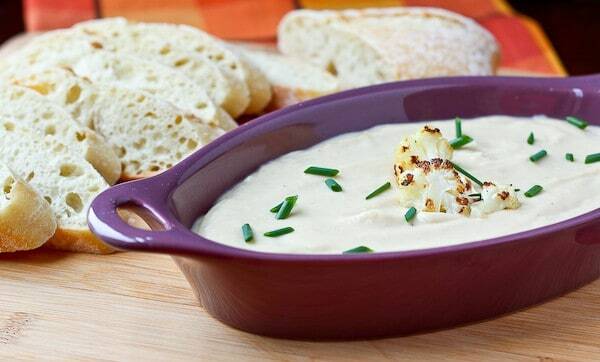 Serve the cauliflower and cheddar dip warm with bread, crackers or vegetables. Enjoy! Whisk in flour and continue to cook for 1 minute. Slowly add milk while continuing to whisk. Continue whisking over medium heat until thickened slightly. When the cauliflower is roasted, add it to a blender with 1/2 cup of the milk mixture and puree until smooth. Stir this into thickened milk until combined. Remove from heat and stir in cheese until melted. Note: If you don’t want to turn your oven on to roast the cauliflower, you could alternatively steam it. However, make sure to thoroughly drain it to prevent the dip from becoming watery. Verdict: Delish! It tastes like cauliflower with cheese sauce…probably because that’s basically what it is. Husband’s take: He liked it! I think he would have preferred more cheddar and less cauliflower but I love the easily identifiable cauliflower flavor in this dip. 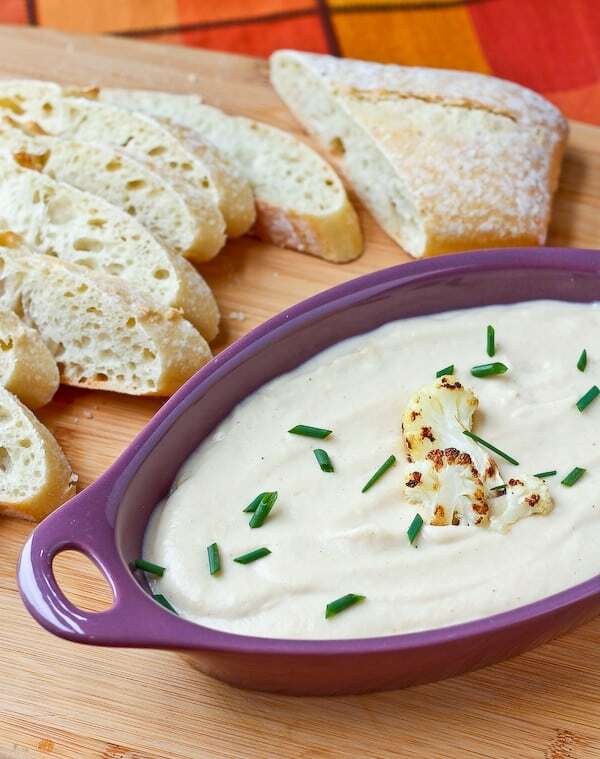 Looking for more great dips like this cauliflower and cheddar dip? Try Hot Caprese Dip, Broccoli and Bacon Beer Cheese Dip, Raspberry Cheesecake Yogurt Dip, Jalapeño Yogurt Dip, or Cheddar Stout Fondue. And of course, I have a Pinterest board devoted to the subject of dips! Would you expect anything less? Follow Rachel Cooks | Rachel Gurk’s board Delightful DIP Recipes on Pinterest. **Disclosure: I am thrilled to be a dairy ambassador for Milk Means More. I have been compensated by Milk Means More for my time. All opinions are as always, my own. Find out more about why Milk Means More on Twitter, Facebook, YouTube, Instagram and Pinterest. That is definitely one of those songs that gets stuck in a person’s head! 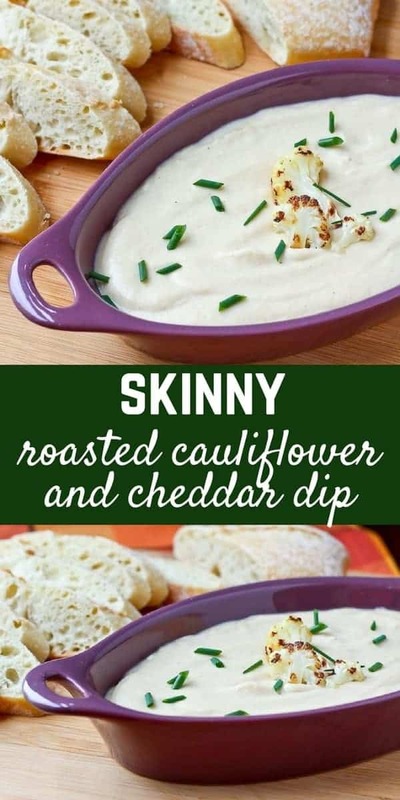 I love this dip and how you used cauliflower to make it healthier! I love that this is so much healthier than a regular dip but sounds and looks just as good. 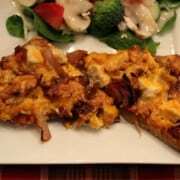 Such a great idea to use the cauliflower! That looks incredible! I’m all for appetizers. Haha I always sing that song when I make dip, too! So funny. I love a good cauliflower cheddar soup, but have never thought about having it in dip form. I love the idea!! 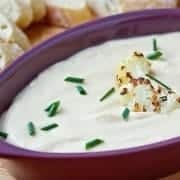 I LOVEEEE blending cauliflower into dips to make it ULTRA smooth and creamy, but not so hard on my almost-bikini-season waistline! I want to dip my whole face into this all. day. long! P.s Now that song is stuck in MY head. Pinned!